To help shed light on these more natural and balancing avenues for a surgeon’s SEO strategy, below are three non-SEO-specific strategies that are both safe and effective at increasing a website’s authority, credibility, and overall keyword rankings in Google. In essence, the more reviews a surgeon has on his or her web properties (be it a Google+ page, Yelp page, Facebook page, or other directory/social profile) the more credibility and trust those properties have. This is particularly the case when most of those reviews are 4 and 5-stars. A heavily-reviewed web property is an SEO asset in itself. For instance, reviews are one of the many variables that Google uses to determine its local search listings (the 3-pack with the Google map). Additionally, other websites like Yelp take reviews into account when determining their internal search results. Establishing a review system that encourages happy patients to leave a good review on your web properties is invaluable for not only SEO, but reputation management. 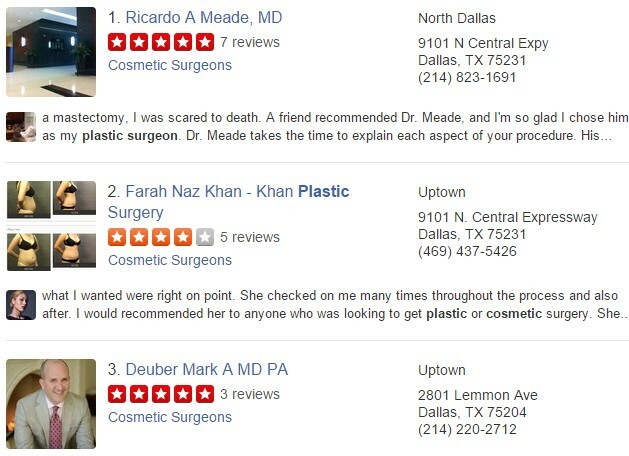 Because choosing a plastic surgeon is serious decision for many individuals, reviews are a critical factor in any surgeon’s business. While this may or may not be offered by your SEO company, setting-up a review system requires some level of creativity perhaps even some training. Making it easy and offering incentives are good approaches to solicit reviews. Whatever it takes, do your best to get as many 5-star reviews from your happy patients on Google+, Yelp, and other web properties you have. 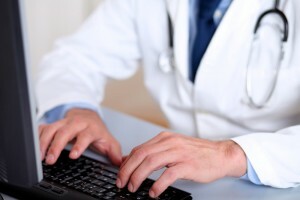 The impact of social media on SEO for surgeons has been a hot debate for the last several years. However one thing that’s been proven is the role social signals (i.e. Tweets, Shares, Likes, +1’s etc.) have in defining popular content. Social popularity, as denoted via social signals, indicates credible content that’s worthy of higher rankings. Social signals play a vital role in helping Google find, crawl, index, and rank pages. Additionally, these elements need to be kept top of mind in any plastic surgeon SEO strategy. For this reason, investing time and resources in social media should be just as important (if not more important) as investing in specific SEO services, like link building. Take time to follow other related pages and social profiles, share relevant content (especially your practice’s blog posts, videos, or articles,) and engage with users. Invest resources in social media advertising and sponsored posts (primarily through Facebook and Twitter) to grow your audience and expose content in front of new eyes. Cultivating a strong social media following is powerful asset in your web marketing portfolio. It can be the edge your surgery practice needs, especially if your in a competitive metro area like Miami, San Francisco, or Dallas. 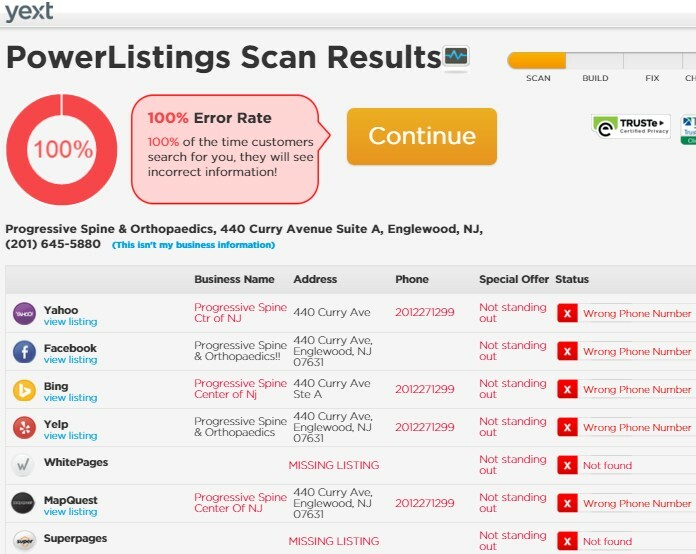 Get listed on as many directories (both local and medical/surgery-related) as possible. Get your content published on other websites and blogs. The purpose of the first approach is to boost your practice’s ranking in Google Local search. In reference to the image above showing the Google local listings and map, these rankings are determined by the volume and accuracy of citations a practice has. A citation is simply mentions of a business’ Name, Address, and Phone number. 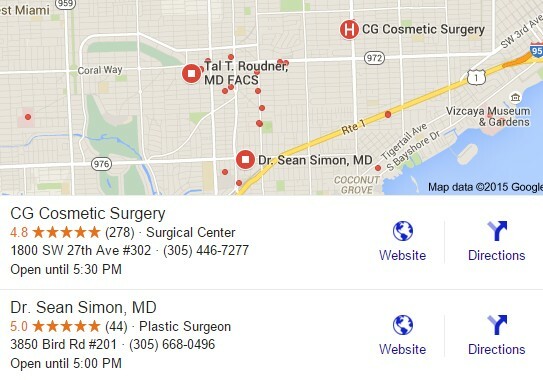 If a surgery practice has a high volume of citations (most common on directory listings,) and all citations are accurate and consistent with the right information, the practice will have greater potential to rank higher in the Google local listings. In short, Google uses citations as a means to determine the proliferation (thus popularity) and credibility (hinging on the accuracy and consistency of citations) to determine who rankings in the 3-pack, and how high. Yext.com is a great resource to see how accurate and proliferated your citations are across about 55 top directories on the web. Here at Optimized Surgeons, we are an official Yext reseller and can help you get your practice populated and optimized across all of these directories in a matter of days. Getting your content published on other websites (whether voluntary via guest blogging or involuntary via a great YouTube video someone wants to embed in their blog post) can have incredible value for your plastic surgeon SEO efforts. In addition to the exposure your practice can get, having your content published on other websites usually means that you’ll get some kind of link or reference back to your site. Whether you get a backlink from a guest blog post, or citation reference, these elements will greatly improve your SEO strategy. Awareness plays using Google Ads, Facebook Ads, and other platforms can also help supplement SEO.